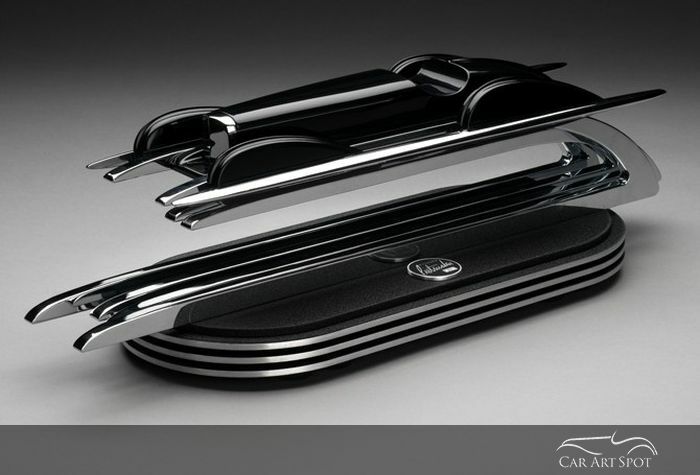 Form follows fantasy - the motto of designer and automotive artist Richard Pietruska. An interview by Marcel Haan. Richard Pietruska grew up on the East Coast of Connecticut. He was drawn into automotive design at an early age when his brother-in-law bought a 1950 Impala which totally impressed Richard. He entered the Fisher Body Craftsman Guild competition held by General Motors in the early 50’s and 60’s and won the Top National scholarship for the Junior Division at the age of 15 which was quite a lot of money back then. Richard submitted a model of a car which he had designed. The competition had entrants from all over the country and was an amazing chance for young people to get into motor design. He then went to the Art Centre and is still there today, 41 years later, teaching students. 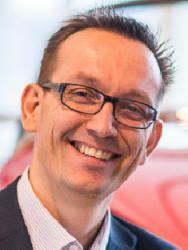 Today Richard teaches automotive design at the Art Centre and says that after 40 years, he is ‘one of the old timers’. Some of his students are now famous car designers and it makes him proud to see how well they are doing. It’s a unique experience. ‘No more ugly cars’ is the motto Richard uses to teach his students and says it is hard to stay open minded but there are certain proportions and designs which he needs to keep in mind when judging the students designs. At the moment, Richard and his students are doing a new project for 2030 trying to design a new Cadillac while envisioning what the brands will be like in that era. Will the cars look like they do now? Not just autonomously but from a design language form? When Richard was at school, he and fellow students idolised unobtainable cars like the Ferrari but now it’s not quite the same. 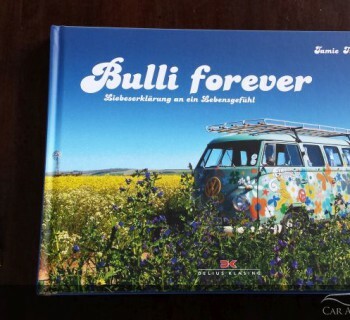 It’s a difficult challenge and as an artist, he is trying to push his students to look into the future while learning something about the history of old cars. 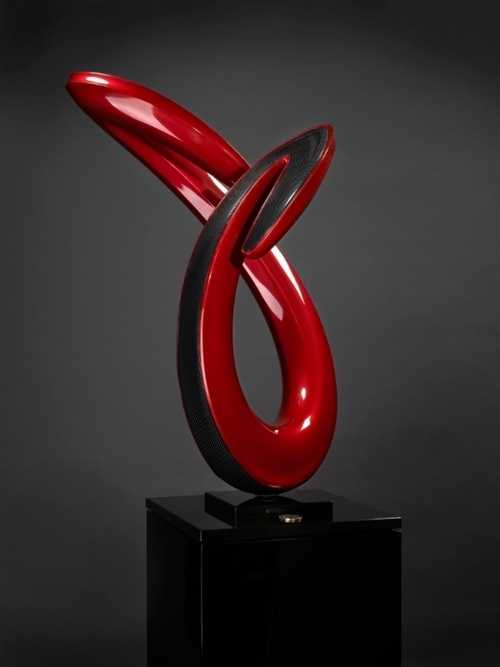 Form follows function is the established rule of thumb in design but for my sculptures I use 'form follows fantasy'. I teach my students a bit of both, otherwise they wouldn't get the opportunity to take risks and sometimes you need to take risks. This is sometimes hard for Richard to communicate to his students because they are often afraid to take risks in their automotive design. Students who do, are usually the ones who get offered a job because car companies are looking for unique individuals who don’t just follow the norm. An example would be Honda who typically always hired the same type of designer until two or three years ago when they did a complete switch. They picked the whackiest guy who had cowboy boots, long hair and a radical portfolio. They just got tired of everyone following in the same niche. So you can’t really predict what car companies are going to do. When you produce something which is truly creative in all the different aspects, it’s much more beneficial. As an artist, Richard has done paintings and even tapestries but prefers to express his artistic talents in sculptures and Pebble Beach has been a great venue to show off his latest creations. While a lot of people love his work because it is so unique, others may find it a bit unusual from a fine arts perspective. Whereas a lot of artists tend to stick to the same style of painting, Richard wants to do something truly different and get responses from people. 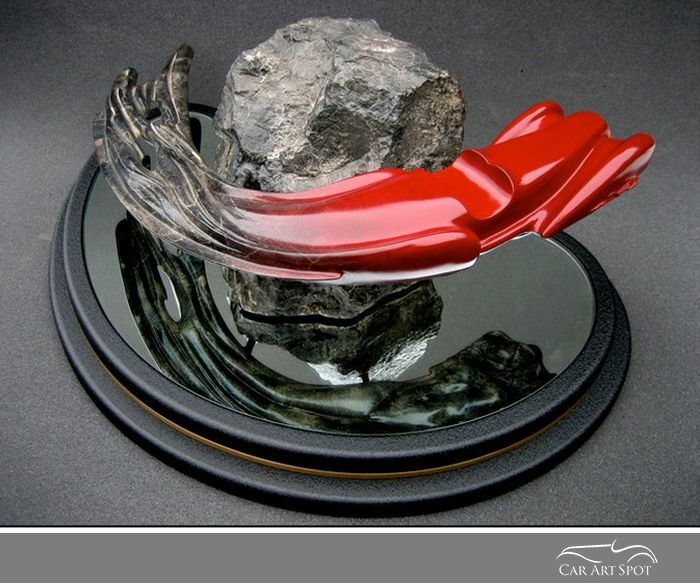 He comes up with a concept and then tries to figure out which new materials he can use, while still keeping it in that automotive fine arts category. Richard loves Stanley Rose’s work which he finds so adventurous. They are good friends and have lots of conversations at Pebble Beach about the difficult road of automotive art being seen as Fine Art. Pebble Beach is a great experience, says Richard. He finds it very motivating being there with the other AFAS artists and the people who go there. It challenges him to do something different each year and he loves the responses he gets. Quite a few of Richards sculptures have an animal snake shape and others have female forms. Marcel was curious and asked Richard if he purposely uses these two elements in his artwork and why. Richard explained that so much of automotive design can be equated to the female form. 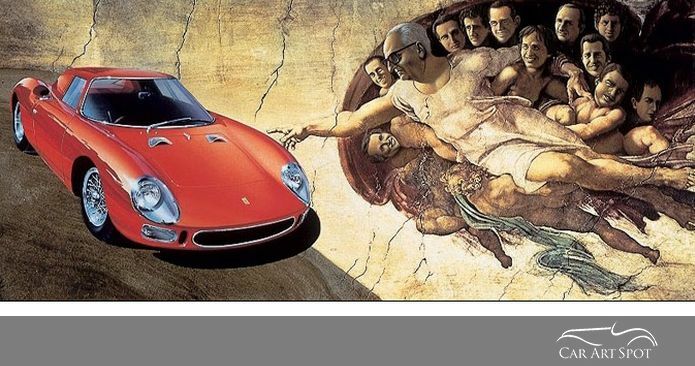 If you look at the Ferrari GTO and old Delahey’s and other old cars, they have very sensual characters. This is the reason why Pietruska twists his automotive sculptures around, so that the similarities can be seen between the female form and the car styling. 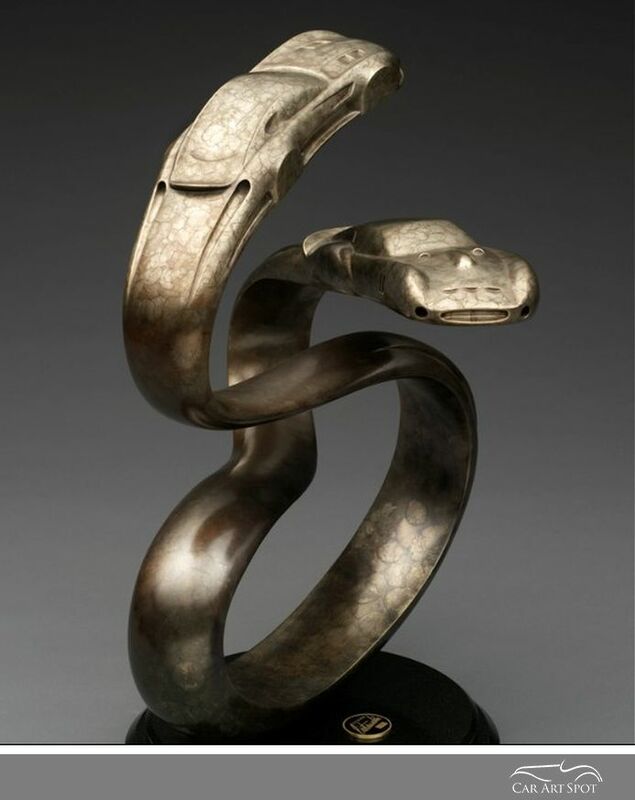 The animal form sculptures are basically because the car is a Cobra. Some of his sculptures are more Art Deco, while others deal more with the female form. If you take his Alpha Romeo 2900B sculpture, you will see a nice looking Alpha turning around a rock but then if you look in the mirror at the other side, you will see there is a female body in there as well. These are the subtle things Richard likes to do in his sculptures. Most of which are limited editions or ‘one offs’. Although Richard does do commissions, he prefers to have the freedom to produce his own creations. Like his Veronique series, which he is very proud of and still considers his favourite because he tried to capture as much of automotive design in a figurative sense as possible. He is working on a piece right now for Pebble Beach this year which will really stand out. Something really unique which people will appreciate. Note: do you notice the reflection? What is the process for a new creation and does Richard have a long bucket list of new projects? Well he has a folder which he looks at every so often. 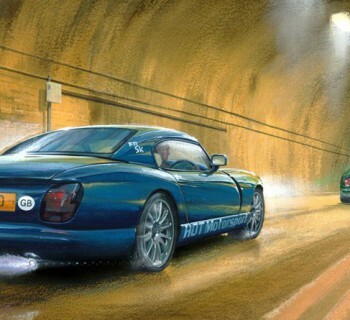 Like the project he is doing at the moment which came from a sketch he did at Pebble Beach. He sometimes wakes up at night with a car in his mind which he knows he should do. Richard then starts working on that automotive. He likes to stretch the form out without losing the essence of the vehicle and in doing so, he has learned to appreciate all the subtleties which have gone into the actual automotive design. 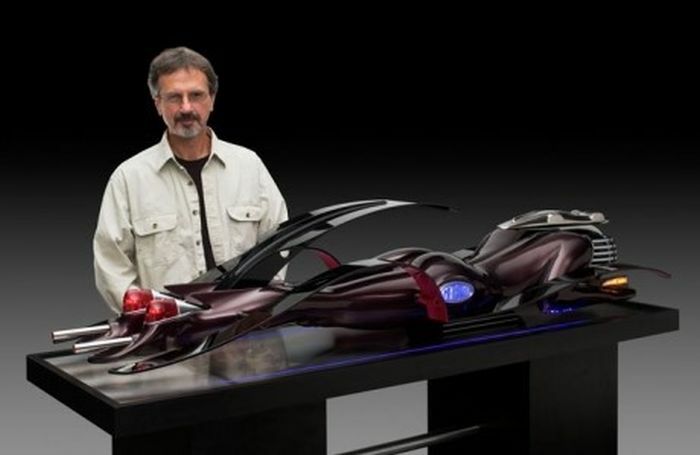 With his sculptures, there are so many processes involved which is very much like producing the real car itself. It’s always a learning experience to see how the car was actually designed and its’ functions. It’s a good balance of stretching them and communicating the form and it’s also a learning curve finding the right materials and techniques. Like for instance, water edge cutting which is a good area for Richard because it allows him to use many materials such as bronze casting, fibreglass, paint etc. Finding the right materials is a process and has meant that Richard has had to start over a number of times. He spends hours, days, weeks on one piece trying to get it right but when it is right, he knows it. 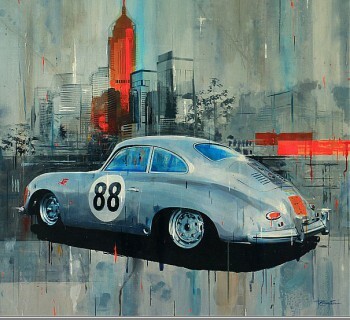 Dan McCrary - Musician turned Automotive Artist!